Dirt Killer pressure washers combine the durability of high quality construction with a Kranzle pump for long lasting equipment. Most pressure washer pumps with all ceramic plungers are quickly damaged when run without water or left to idle for too long. The Kränzle pump can run without water or idle in bypass for hours without damage, preventing expensive accidents caused by operator error. All Kranzle Pumps are capable of self priming from a tank, pond, or ocean. The advanced German Kränzle pump has a 10 year warranty making it one of the best backed in the industry. These units range from 2000-3500 PSI. Honda gear driven overhead valve engines provide for reliable units and readily available parts. Read more on cleaning unit application guidelines. This Dirt Killer pressure washer is designed for portability for light industrial usage. Ideal for decks, buildings, crab pots, fishnets, boats or vehicles. Other Kränzle Powerwasher models also available, please call 1-866-858-4982. 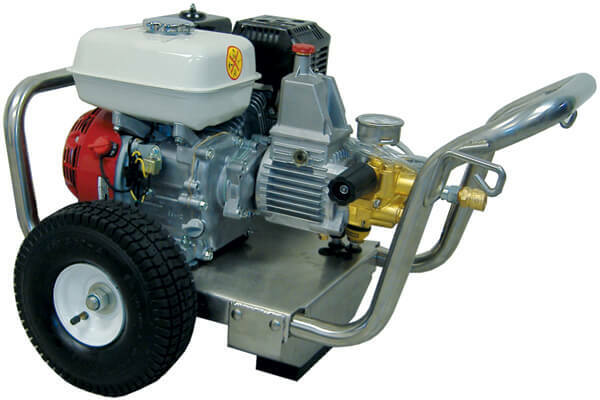 This Dirt Killer pressure washer is designed for portability for light industrial usage. Ideal for decks, buildings, paint removal, boats, and concrete cleaning. Compact frame with a lot of power. 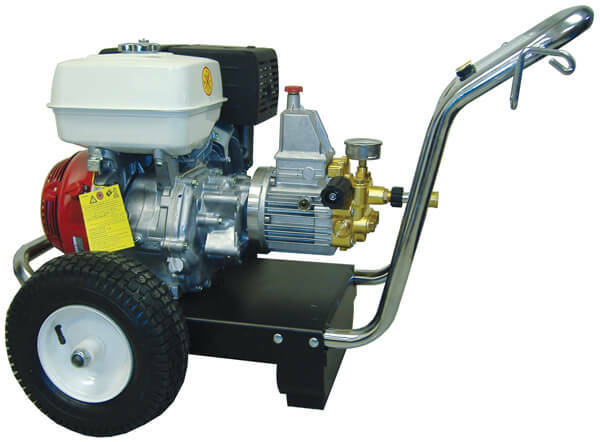 This Dirt Killer pressure washer is designed for portability for light industrial usage. Ideal for decks, buildings, crab pots, fishnets, boats, vehicles, and concrete cleaning. This is a unique inlet suction filter for drawing out of pond, lake, drum, ocean, barrel, and river. The Variojet Nozzle functions as four flat tip nozzles all in one. Often referred to as a variable nozzle, simply twist the barrel of the nozzle to vary the high pressure spray from 0° - 35°. To use your chemical solution push the barrel forward for low pressure soap application. Dirt Killer (DK) nozzles, which feature a rotating turbine, deliver the punch of a 0° nozzle with a 25° fan. This creates 10 times the cleaning impact of standard flat tip nozzle - effectively cutting cleaning time in half. DK spins faster. Good for cleaning wood, brick, paint prep., etc. Dirt Killer nozzles can easily be rebuilt. The Industrial Dirt Killer (IDK) spins slower than the Dirt Killer nozzle thus creating a larger water droplet with a greater impact. Good for cleaning concrete steel, barnacle removal, etc. Industrial Dirt Killer nozzles can be rebuilt easily. The rebuild kit includes all internal parts, so once the nozzle is rebuilt it is like new.